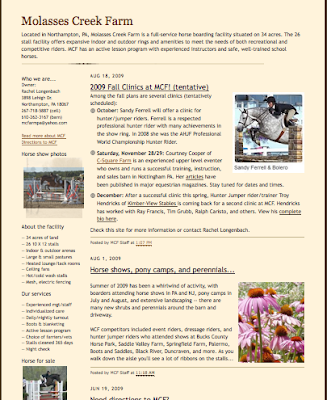 Behind the Bit: What do you look for in a boarding barn Web site? What do you look for in a boarding barn Web site? I'm helping -- as sort of a fun side project -- to put together a Web site for a barn in the area, a very nice facility and nice people who want a Web presence to give them a bit more visibility. I'm using blog software because my blogging skills are far more up to date than my web skills (alas). While there are arguments for both platforms, a blog platform will compel us to keep the site updated/fresh which will increase visits. There is alot happening at this barn anyway, showing, camps, clinics, etc. Here is a snapshot of the draft (click to enlarge). The site in progress is at www.molassescreekfarm.com. For this particular site, certain info is forthcoming (trainer bio, pictures of the facility itself). What info should be front and center, what can be on a subsidiary page? As a viewer do you mind the date/journal format? Leave comments! And thanks for your help. 1. For prospective boarders: list of what services and feed are provided. Photos of rings, barns, paddocks, shelters and horses. Cost of boarding and lessons. 2. For prospective riders: photos of rings, horses, people riding in safe and appropriate equipment. If you are going to update the site regularly, then all of the above, and a list of clinics, lessons, shows that the barn riders/boarders are involved in. The website for my parents' farm has gotten tons of compliments (I built it using GoDaddy's Website Tonight, which is a web-based, WYSIWYG editor). The only pages that have gotten much updating since we built it about two years ago are the Events page, which is updated as clinics are scheduled/take place, and the Cross Country page, as our XC schooling field is one of our biggest draws. Our goal is not to constantly be updating to drive SEO and capture web surfer prospects (I don't have that kind of time! ), but to provide information for the folks who find us via more traditional avenues - the majority of our traffic comes from our business listing with our local GMO and our yellow pages listing. Personally I put a priority on pictures - the facility, the grounds, the amenities - and providing information in a conversational tone (you are doing a great job of this already!). I greatly like to see a good amount of pictures depicting exatctly what the website talks about when refering to it's facility specifically. - If they have an indoor, I like to see it. Basically anything that they talk about descriptively, I like to see. BUT an exception is the pictures need to be taken with someone who has an eye and placed fairly strategically on the site to appeal to the viewer. I.E; showing the arena without showing the manure pile in the background. Classy, simple, creative and most importantly (and tying all the above into one..) welcoming to the visiting eye. I like the idea of using the blog platform. I agree, it seems like updating would be much more friendly. The only problem with the blog platform is it's restrictions in the placement and enhancement of the navigation and it can be a little harder for someone to get around who is not used to the blog platform. However it certainly can be done! Which brings me to my other point, updating. Crucial!! I hate to come across a beautiful site, beautiful barn that lacks in the updates of not the "news" but also with the entire site. When I design a site, I go by; classy, simple, (yet) creative, user-friendly, professionally functioning. Good luck and best wishes on your project! It's fun to see it come together!! Definitely a focus on what that barn can offer me as a customer. The more open it seems that they are about who they are, what they do, and how much it costs, the better. Frequently updated sites with info on showing, important events, cool things that happened, stuff like that--I like that. Shows someone cares enough about the site and the barn to keep things happening. Definitely important is price list for everything--pictures of the stalls, the facilities, descriptions of the offered care, the cost of lessons, any specifics in terms of lesson scheduling or experience groups or age groups, specializations... Any special programs they may offer, things like that. Pretty much everything can go on secondary pages, I'd say, but having a basic "hey, this is who we are" and the latest news on the front page is always great! In addition to what Amanda and Fiona have said, I think it would be a smart idea to provide some detailed background on the farm managers/owners/employees. I managed a farm for four years and consistently heard boarders mention that it was the individualized horse care, politeness, and knowledge of the staff that encouraged them to board with us. Funny enough, that farm is now under new, novice management and depsite the lush pastures and sand arena, boarders are leaving in droves. What a coincidence... I spent most of yesterday putting up a website for my trainer's farm as well, and asking myself the same questions! I agree that photos are important. As a potential boarder, I think people want to know that the level of care is something above the bare minimum, and potential riders want to see the rings and read about the trainers' accomplishments. Nice job so far! When I am looking for a place I like to see pictures of the facilities: the stalls, tack room, arena(s) pastures etc. I also want to know the cost and what it includes. By having these things online a potential boarder can decide whether she/he wants to go see the place in person or not. That way less time is wasted. I think a blog format is ok, as long as critical information is still easily accessible. So, let the blog give updates on what's going on, but have other pages in an easy to see and logical spot. The sidebar. The top. Something. 1) Pictures. If you board, I want to see where. I want to see well-maintained fences, horses, and grounds. I'm not so concerned about seeing fancy horses, just the facility here. 2) Services provided. "Full care" means very different things to very different people, so be sure to break it down. Do you offer braiding, training, lessons, massage, or something else? Tell people. 3) This ties in very closely with number 2, and really maybe should have been first. PRICES. If I look at your website and love everything, then go for a site visit and find out that it's way out of my price range, I'll be annoyed. Be sure to enumerate. Break down what board costs, and what is going to cost over and above that basic formula. Do you charge extra to feed grain or blanket? Do you give a beak on board if the boarder provides their own hay? 4) Hours. If you have scheduled times for boarders to ride or host events a lot, I want to know. 5) Resume of trainer. If it's just a boarding facility, I don't really care too much, but if you're advertising your services to train horses and riders, I want to know what you've done, if you're certified in anything, and what your goals are. I think that's about it... I mean, obviously contact information, too. I agree with the others that have already posted about the need to post prices. I am currently looking at boarding barns and if they don't list prices I normally give up on them entirely. I also like to see how many stalls they have as that gives you a pretty accurate idea of how big, and busy a barn might be. I also think it would be nice to list if there is any space available, especially if the site will be updated regularly. We've done lots of moving, with my husband in the Navy, so I've had the *ahem* 'pleasure' of searching for barns a few times in the last 10 years. We're not your typical horse family, as my husband does most of the competing, and I'm there to ride and tell my mare how pretty she is. For boarding, a list of your amenities is great. Don't forget to put your prices (as well as any discounts) on there. I'm always intimidated by barns that don't post any prices. The "if you have to ask, you can't afford it" mentality. For training, a list of what you specialize in (by 'you', I actually mean the trainer). Where did you learn, what do you specialize in? etc etc. Don't say, "trains beginner to advanced dressage." Advanced? 4th, PSG, I1, GP? Do you show? Where? Prices are always good. How often are horses getting worked, etc. Also, an updated list of shows that the barn is going to participate in is great. That way, I can go check you (and your horses) out, without having to make uncomfortable small talk initially. Contact information and barn pictures, lots of barn pictures! Horses happy, horses in pasture, horses being worked, horses competing, etc. Do you have horses for sale? For lease? Show lease? Are there schoolmasters to take to the show? Those are all important parts for me. My husband just wants a good trainer (that knows their stuff and doesn't annoy him) and a reasonable price. Blog format would be a great idea to keep the events updated, but if you/they don't plan on updating on a regular basis (i.e. once a week), then go with some other template. Good luck! I can't wait to see it progress! I love what your are doing right now: it'll stay up-to-date! That's a big thing for me. I hate it when I see a really nice place and then also see it hasn't been updated since 2000. Not good. Lots of good, professional-looking photos! I want to see not only the students in a lesson, but also the instructor riding. If the instructor is a crappy rider or an excellent rider, it'll definitely reflect in his/her students! A good list of credentials and testimonies. And if their previous instructor has a website, I would like to see that too! Good pictures of the facilities are very important to me as a boarder. While it's cute, I get that funny feeling when I see Little Sally riding Pumpkin the Pony without a helmet or tack or anything. I've known too many mean ponies lol! It looks like a really good site so far. If I lived nearby, I wouldn't mind boarding Greta there and definitely wouldn't mind taking lessons! 1. What services the barn provides... in detail! I also look for pictures of the ring/s, barn/s, paddocks, fields, shelters, feed rooms, tack rooms, and (if possible) an aerial view of the property to see distances. Or you can just tell the distances between things (i.e. the barn is right next to the indoor ring, but about a five minute walk to the cross-country course). I also look for prices. Another thing to note, is that I like it when barns say somewhere that I will notice that they have a stallion (if they have a stallion). Its nice when they tell me how they make sure their stallion stays away from the other horses. I also like to see an updated blog on their website. If it isn't updated regularly (maybe once a week), then I would say don't make that a prominent feature in the website. 2. I want to see prices first off, and rules. I want to know if every rider at the barn is required to wear the appropriate safety gear(a big turn-on for me. If you require that, it makes me think you are a good facility). I also want to know if they have a show team. If they are group lessons, then I want to know how they make sure that each rider is progressing. Are there levels to their lesson program? Are the instructors able to move individual students up levels to different lessons that match the student's level if need be? I want to see pictures of horses, see pictures of riders, and see pictures of both higher levels and lower levels of riding. If they show, I want to see pictures of them at shows. Always have pictures of people in the appropriate riding gear. I also want to see when you can have lessons, and if you continue year round. i'm looking for boarding right now and am scouring the internet for everything. i like it when there are some pictures of the barn (inside and out), a picture of the ring, maybe an overall picture too. just to get an idea of the facilities. it looks better if it's clean. so while the barn may be great, it just looks a little nicer in the pictures if the the barn aisle is clean and not dirty. if there is no pricing listed, maybe a break down of services available for the different rates, or just the breakdown of what is included. if there's a trainer, a bio is great. a lot of sites have a news page where they update with show results which is a nice touch. i agree with a previous poster that i really like to see the boarding cost listed online instead of having to contact each place individually just to find out that i can't afford it. Price. Price, price, price. There's such a huge range of boarding fees, and we all have fixed incomes. It saves me (and the barn owner!) so much time if I don't have to call and ask what her "competitive rates" or "customary rates" are!